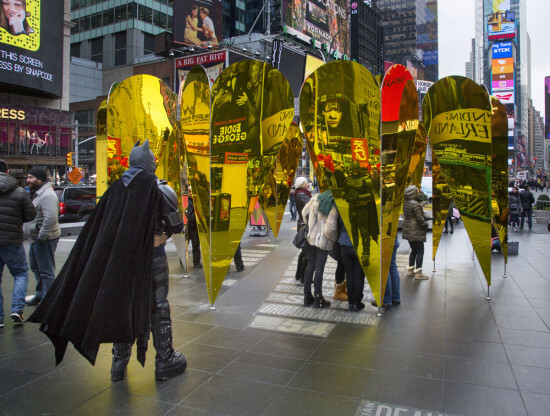 Every winter, the Times Square Alliance and the Center for Architecture choose a team of architects to design an installation for Times Square that a) has to both dialogue and compete with the pageantry of Times Square and b) is heart-themed for Valentine’s Day. 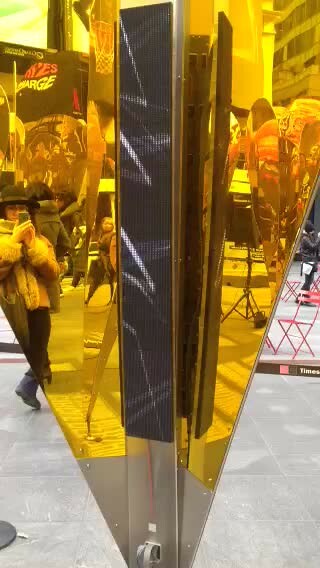 AN visited this year’s Times Square Valentine Heart Design competition winner, Collective-LOK‘s Heart of Hearts, during its final week to speak with the architects and an artist/composer duo who created an interactive sound and visual piece within the installation. Formally, Heart of Hearts is a circle of aluminum–paneled hearts planted in the center of Father Duffy Square, a public plaza between 45th and 47th streets at Seventh Avenue and Broadway. Joshue Ott and Kenneth Kirschner, Times Square Alliance artists-in-residence, installed variant:breaker, a one-day interactive audiovisual installation that used four LED arrays and speakers that plays on Heart of Hearts’ reflectivity to create an outdoor theater of sound and light. 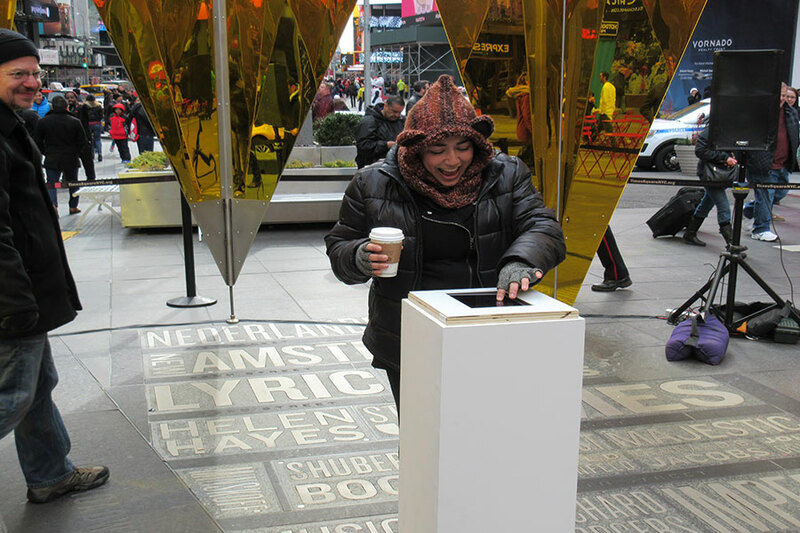 Conceptually, the objective of Heart of Hearts was to “out Times Square Times Square,” explained Michael Kubo, one of three members of Collective–LOK. The trio wanted to take the hilarious spectacle that is Times Square and reflect it back onto itself, while creating inviting spaces for the more intimate spectacle of the kiss-and-selfie. The architectural renderings that accompanied the rollout of the project depicted a wedding, the Naked Cowboy, the famous llama, and the other happenings that give Times Square its weirdness. It turns out that the renderings were predictive: on Valentine’s Day, despite the chill, multiple weddings were staged in Heart of Hearts. In reviewing the photos, it was uncanny to see the the fragments and reflections (those pink fists!) that accompanied my image. 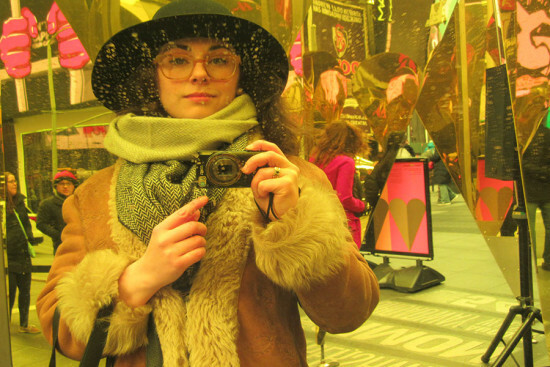 The image could hardly be called a selfie, as Times Square inserted itself as a subject from all angles. Although the installation commands attention in the physical and virtual worlds, it had to make a minimal impact on the plaza. Drilling into the ground was verboten, so Collective–LOK designed an installation that was self-supporting. 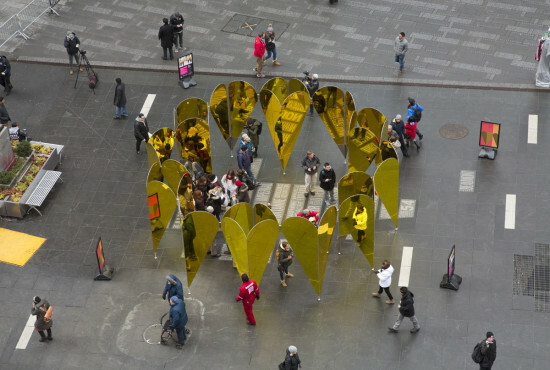 To give the installation its necessary rigidity and weight, the segmented hearts, which weigh a few hundred pounds apiece, were made from a quarter-inch-thick aluminum core sandwiched between eighth-inch gold acrylic mirror panels. 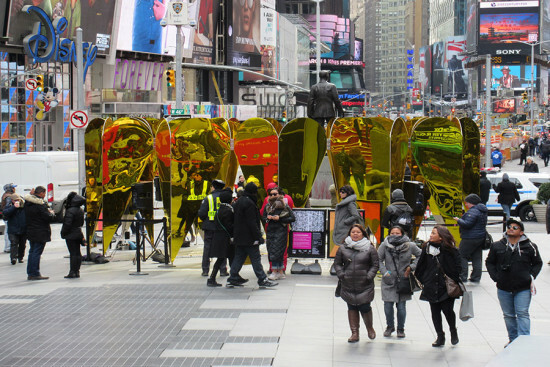 Working with Brooklyn–based Kammetal, Collective–LOK had around one month to fabricate the piece and, due to the 24/7 activity in the square, an overnight installation timeframe a day before the unveiling.